Arsenal reopened competitive action when they faced Newcastle United on Monday night. The tie which held at the Emirates Stadium ended 2-0 in the hosts' favour. Aaron Ramsey and Alexandre Lacazette crowned their impressive performance with a goal each to ensure their side claimed all three points to go third on the Premier League table. The Wales international had his goal disallowed for a foul on the opposition by Sokratis Papastathopoulos earlier in the match but it had been written that he won't leave without fulfilling fate's wish as he sent the Gunners ahead in the 30th minute. Laaczette doubled the lead six minutes to time after substitute Pierre-Emerick Aubameyang's header set him up. The Frenchman's classy lob over the visiting goalkeeper was enough to decide the results for the day. 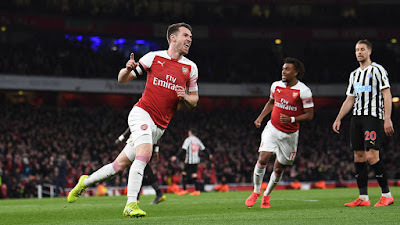 Ramsey was on top in that match just as he had been in recent games and the reality that he would soon be leaving to join Juventus at the end of the season hit fans so hard. While some wondered why he was allowed to leave in the first place, others wished he could just remain at Arsenal till eternity. Praises from left, right and centre were heaped on the 28-year-old whose efforts combined with those of Mesut Ozil and Lacazette gave Unai Emery's men high chances in last night's encounter. Aaron Ramsey is the player Manchester United fans want Pogba to be. Wether you like it or not. End. Ramsey celebrating with the armband. Why have I been robbed of the next five years of this? It was a great way to put an end to the 18-day pause caused by the international break which got some players like Granit Xhaka injured. Arsenal have leapfrogged Manchester United and Tottenham Hotspur to go directly behind Manchester City. An added advantage for them in the race for Champions League qualification is that they have got less tough games to play compared to their rivals. If chances are well taken, they will surely end up in the top-four zone. Arsenal will head to Merseyside for their next Premier League match against Everton on Sunday afternoon before hosting Napoli in the first leg of the Europa League quarter-final the following Thursday.